Today I am going to reveal to you a new conspiracy concerning the Statue of Liberty. I have been reading Rob Skiba’s book Babylon Rising. The Babylon Rising book is teaching me about occult symbolism in America. I must admit I had a rather naive opinion of the American Founding Fathers before reading this book. Basically I erroneously assumed that since Mr. Adam Weishaupt is credited with establishing the Illuminati around 1776 that there was not enough time for the Illuminati to influence the early USA Founding Fathers. Silly me. Freemasonry itself traces its roots back to Ancient Babylon! After reading Babylon Rising I have a much better understanding of what happened in early America. This got me thinking about symbols of America. I have some unique things to say about the Statue of Liberty. Also I have a brand new conspiracy to share with you about it. These quotes on the Statue of Liberty Wikipedia page are insightful. But they do not tell the entire story. You see Libertas wasn’t just worshiped in Rome. She found her way onto The Great Seal of France in 1848. Also known as Marianne. Now Frédéric Auguste Bartholdi was a French artist. He was a Freemason who loved Egyptian monuments. This is not according to me. It is according to the official park service page! The original design of “Liberty Enlightening the World” wasn’t even intended for the United States. The original design was for a colossal statue of a woman holding a torch in Egypt – but it got turned down. Many people know these things. Here are things most people do not know. The Libertas goddess explanation is provided as “factual” on the official Statue of Liberty Wikipedia Page. For sure it is an abomination to Christians. I am specifically reminded of Leviticus 26:1. There are many more Bible passages concerning this. I encourage you to learn what paganism is so that you can identify it when you see it. Speaking of paganism – have you ever tried a google image search for “Hecate” or “Hekate” or “Hecate figurine” or “Hekate art”? I suggest you do. The spikes on the tiara. The torch. Ladies and gentlemen the Statue of Liberty looks like Hekate the goddess of witchcraft. Do you know how very few Americans know this? Now you do. If the Statue of Liberty looking like the Ancient Greek Witch Queen isn’t earth shattering enough for you then don’t worry there is much more. Are you familiar with the ancient goddess Semiramis aka Ishtar? She was queen of Ancient Babylon. That is a key connection I will make in this post. If I can make that connection from Statue of Liberty to Ishtar then I can show you a wild conspiracy. There is more. Do you recognize “The New Colossus” poem? Now the “old” Colossus was the Colossus of Rhodes. The Colossus of Rhodes was one of the seven wonders of the ancient world. It was a giant statue of the Greek god Helios aka a pagan god. This further reinforces that the Statue of Liberty is a pagan goddess statue. Circle back to Emma Lazarus. Do you know any of the other poems by Emma Lazarus? I do. Her last poem is entitled “By the Waters of Babylon”. Please note the obvious that the Statue of Liberty is by the waters. Is Emma – the person who helped fund raise for the statue’s completion – calling America Babylon? Emma is known as a faithful Jew in many historical references. What faithful Jew writes a fund raiser to erect a giant pagan goddess statue? A very confused one to say the least. At this point if I have linked Lady Liberty to Babylon to Ishtar to your satisfaction then we can link her to Astarte. Consider the Astarte Wikipedia Page. It tells us Astarte is the Hellenized version of the goddess Ishtar. In plain English they are the same goddess. I have now traversed the goddess heirarchy from Libertas all the way back to Astarte. Now I can show you a wild conspiracy that traces all the way back to Deuteronomy in the Old Testament. If you look up the word “grove” in e-sword (e-sword is free software that provides Hebrew definitions of words found in the KJV Bible) you will find that in the KJV the word “grove” means “Asherah or Astarte – a Phoenician goddess – also an image of the same”. In the NIV version of the Bible the word “grove” is translated slightly different on occasions. It is sometimes translated as what is called an “Asherah pole”. 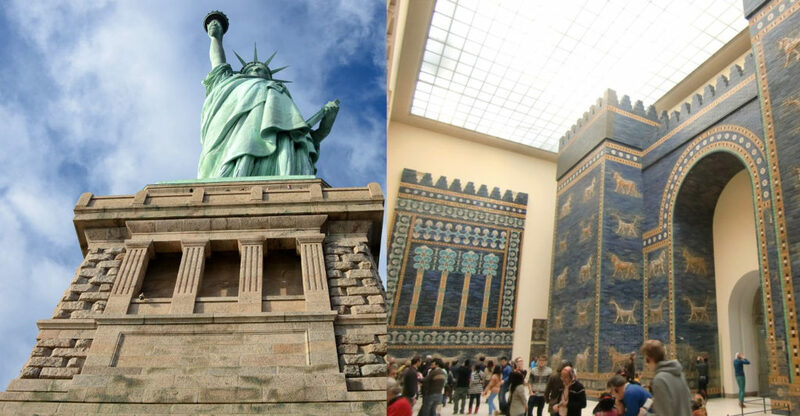 I now propose that the Statue of Liberty is a giant Asherah pole as described as an abomination in the Old Testament. I prefer the KJV Bible but there are times the NIV version is very useful! If you look at the Statue of Liberty you will notice that near her feet the robe resembles a tree trunk. The statue appears such that she totally *could* be carved out of a single (yet giant) tree. Even the angle at which she holds the torch is extraordinarily parallel – much like a pole. From torch to toe the Statue of Liberty resembles a pole. I understand she isn’t made of wood. She is a symbol of many occult things and many ancient goddesses and no Christian things. If she is an Asherah pole it is some of the largest news in American history. Realize that in the Old Testament – specifically 1 Kings and 2 Kings – that Kings are judged by their decision to build Asherah Poles or raze them to the ground. This is literally monumental news. In conclusion I will say this. Let us talk politics for a moment. If the President of the United States is a true Christian he or she will start calling for the demolition of occult monuments like the Statue of Liberty. Paganism was pitched to us as patriotism in so many ways.